(1) is the option selector concerning the localisation of the Excel export file (.xls, or .xlsx alternately on XlContactExport Pro) that will be produced. (2) is the area where informations about the future Excel file appear. 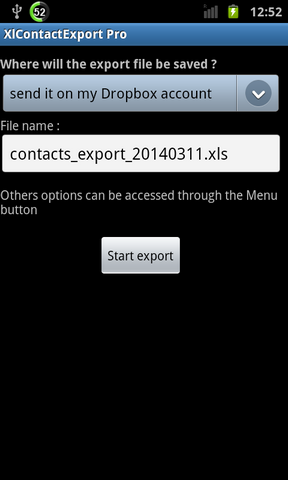 (3) is the button to start the export of contact datas. (4) is an ad banner. This ap is free, so please help us by clicking this banner, or buy XlContactExport Pro which doesn't have ad banners. Please note that if you do multiple exports of your contacts base in one day without changing the file name, a new file will overwrite an old one of the same name. The file will be stored by default using the classic Excel format (.xls / Excel 97 – 2003) so keep the “.xls” extension in the file name. On XlcontactExport Pro, you can also specify the default Excel 2007 workbook format extension (.xlsx) for the file by typing it instead of .xls in the file name. You can navigate taping the directory structure then select an existing directory with the upper button. In the main screen, the file path to use will be modified accordingly. All informations about the FTP account must be provided in this screen : ftp address, ftp account user name, ftp account password, and the name of the Excel export file. Please make sure all the FTP informations are correct before using this option, and that the FTP account offers write credentials, otherwise an error message will pop up in the process. If this option is choosed, the Excel export file will be first created on the SD card in a temporary directory, before being uploaded on the FTP site. The temporary elements will be removed in the process. The email address must be provided in this screen, and the name of the Excel export file too. First of all, please make sure the email client app on your smartphone is working before using this option (ie fully parametered, and able to send a mail), and that the email address is valid, otherwise the operation will not be done (for example, if the mail app is not parametered, the window of the mail app will not open at the end of the export process). If this option is choosed, the Excel export file will be first created on the SD card in a temporary directory, before being add as a file attachment in a new email. The temporary elements will be removed in the process. Your smartphone mail app window should open right after the export complete, and you would have only to push the "send mail" button. The name of the Excel export file too. If this option is choosed, the Excel export file will be first created on the SD card in a temporary directory, before being send on Dropbox in an "XlContactExport" application directory. You will have to confirm the action and give your Dropbox account credentials, which will be kept for a future upload. You can now push the star button, or choose, right before, further options in the "Options" menu. The options menu in XlContactExport is available pushing your smartphone "Menu" key in the current main screen of the app. We will not discuss here the Trace mode option which has a specific function, that option will be described later. the generation of a Header line in the export file. If this checkbox is ticked, XlContactExport will add to the the Excel export file a first “header” line containing the type of each column of data, in order to make the data more understandable. Even if this optional feature is useful for the first glance, do not also hesitate to have a read at the appendix of the Excel file format used by XlContactExport here. the generation of the Structured name columns in the export file. If this checkbox is ticked, XlContactExport will add to the export file a few extras columns that help to define the contact name in a very structured way (given name, family name, prefix, suffix, etc...). This option is not ticked by default, as an incorrect use of these columns, in a import operation with XlContactImport, can disturb users. Indeed, the structured name fields, if used, will always be prevalent on the "display name" field, and this will affect the resulting display names of contacts on the smartphone. the generation of vCards. Using this option, a vCard 2.1 is generated for each contact in the same time than the Excel export file. 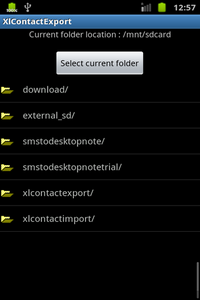 The generation occurs in a subdirectory located in the current export folder. 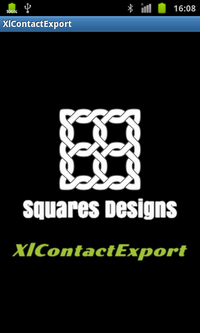 Others export formats (vCard 3.1, 4.0 in plain text, xCard, jCard) are available using XlContactExport Pro. This option is not ticked by default, as the main goal of the app is, of course, to offer the export of contacts in an Excel file. 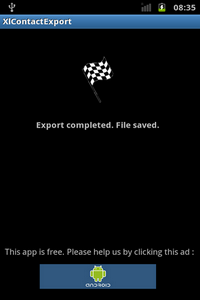 When the export is in progress, this progress dialog screen will appear. Please note that the progress counter doesn't reflect the number of contacts to export, but the total number of operations that must be done. 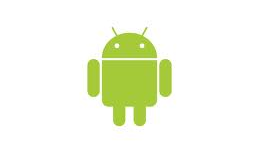 Android 1.6 only : please be patient at the very end of the process. It can take a little time to finish, with the counter staying near the goal (around 90-95%)... The process is not over and the app still running ! If there is an error in the process, an error message will appear in the screen. Otherwise, the export now finished, you can look at the resulting Excel file. The next section, which is an appendix of the Excel file format used by this app will tell you more about the file content. In case of error in the export process, you can use the trace mode. 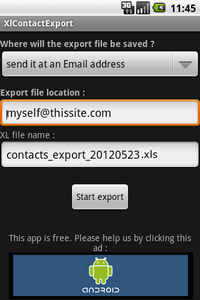 You can activate the trace mode by using the "Menu" key of your smartphone on the main screen of XlContactExport, when you want to retry the same export. Choose the option and that will activate the trace mode (you can choose the option again to desactivate the trace mode). Proceed again with the export. At the end of the process, a file called "trace.txt" will be created on your sd card root directory (in a subdirectory called "xlcontactexport"). Send me the content of this file (with explanations about the encountered behaviour, please) using the form contact here.